Tina's Crop Shop: SIP #159 - Polkadots! Hello and Happy Tuesday! Do you love Polkadots? 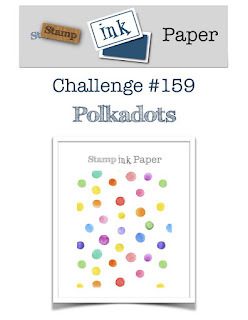 If you do then this week's Stamp, Ink, Paper Challenge #159 is right up your alley! Personally I love them! This was such an easy card! I layered some whisper white on an A2 Lovely Lipstick Card Base that had a piece of the 2018-2020 In Color 6x6 DSP Stack in Lovely Lipstick polka dots adhered to the front. I ran a small piece of Whisper White ribbon (retired) around the front layered panels before glueing it down. I added a Pearlized Doily over it with Multipurpose liquid glue in the middle section. I layered on a stitched Lovely Lipstick Circle and adhered to the doily with dimensionals. On a scrap of Whisper White cardstock I stamped some of the flowers from the Love What You Do Stamp Set in Powder Pink on the background. I stamped the sentiment from the same set over the flowers with Lovely Lipstick Ink and then cut out a smaller circle with the Circles Collection Framelits Dies and adhered it over the Lovely Lipstick Circle. I finished it off with three Pearlized White Sequins. I love when the patterned paper does most of the work for you!